Chevy did not mess around here. Only a couple of days before its public debut at the Chicago Auto Show, Chevrolet unveiled its all-new 2020 Silverado HD lineup and two things about it immediately stand out: 35,500 of maximum towing and up to 910 lb-ft of torque. In order to get that, buyers will have to opt for the Duramax 6.6-liter turbo diesel V8 with 445 hp, paired to a new Allison 10-speed automatic transmission. Working to cool that engine is a massive 28-inch diameter fan, 2.5-inches larger than the current fan. Chevy claims every component between the transmission and wheels was upgraded to enable up to a 52 percent increase in maximum towing compared to the outgoing truck. 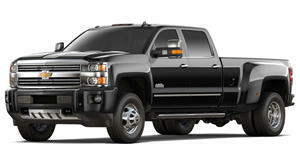 The Silverado HD’s standard power comes from a good for 401 hp and 464 lb-ft of torque. It also allows for a towing capacity increase, specifically by 18 percent. Chevy says this engine is based off its 6.0-liter V8, only it uses a 6 mm longer stroke and direct injection for additional power. At the moment, the 2020 Chevy Silverado HD is the Detroit towing king, besting both the 2019 Ford Super Duty and new Ram Heavy Duty, though Ford is expected to improve those figures in the near future. Other notable features found in the new Silverado HD include an in-vehicle trailering system with up to 15 camera views, called the "Transparent Trailer,” to help make life easier when towing, Autotrac active two-speed transfer case on 4x4 models, an easy-to-fill diesel exhaust fluid (DEF) tank with an opening inside the fuel door, a snow plow prep package, a larger bed step for easier bed access, and that stylish HD-exclusive sculpted exterior design. Diesel and gasoline-powered trucks can be differentiated by slightly different hood designs. Depending on chosen trim, there are unique grilles and we think all of them fit the part of an HD truck perfectly. And speaking of trims, a total of five will initially be offered: Work Truck, Custom, LT, LTZ, and the . The Custom trim, however, is exclusive to the 2500 HD, and it offers standard 20-inch wheels and body-color trim details. All other trims can be had in either 2500 or 3500 HD guise. Step inside and you’ll find a roomier interior than before with, according to Chevy, class-leading front head- and legroom. The overall dashboard design layout is very similar to the . Chevy adds that this new interior is designed to also be a working office, complete with all of the necessary infotainment and connectivity features. There’s also an additional three-inches of rear-leg room in Crew Cab models along with several clever storage options. 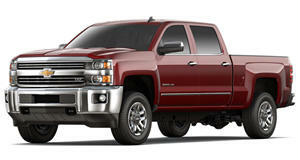 And for the first time, the Silverado HD’s cargo boxes are not shared with the 1500 models. Instead, they were designed specifically for the HD but still incorporate rolled-steel box construction, just as they do on the light-duty models. Chevrolet says pricing for its all-new 2020 Silverado HD lineup will be announced closer to its on-sale date this summer.